Home Articles Will electric cars just be niche vehicles? All-electric cars – vehicles of the future? Yes, if we ignore the limitations on battery production and the supply and transmission of clean electricity. Of course, progress is possible… if you are prepared to invest a lot of time and money. The car of tomorrow will be electric. That’s now a certainty. Or rather, a consensus. But is it just an illusion? Let’s start from the beginning. The car, symbol of the industrial revolution of the twentieth century, has one defect: it pollutes. It has unwillingly become the symbol of pollution, with a formidable magnifying effect – the billion or so cars in use today emit less carbon dioxide than agriculture or coal-fired power stations. Under pressure from voters, governments are imposing increasingly lower emission ceilings. This trend has been accentuated by “Dieselgate” and the COP 21 summit in Paris. Both France and the United Kingdom have announced their intention to ban sales of internal combustion-powered cars by 2040. Paris will ban all old diesel cars from next year. However, the world’s largest market, China, is going one step further. It has made emission standards a tool for industrial regeneration. Lagging behind its competitors on the petrol engine, from 2019 manufacturers will be obliged to produce a quota of electric cars which will increase as progress is made on battery performance. Having resisted for a long time, manufacturers are now changing their tune. “I‘ve changed my mind”, admitted the leader of a large European group. “I am now convinced that the future of the car is electric.” Renault entered the electric vehicle market ten years ago. Newcomer Tesla is shaking up the market. Volvo will stop producing models equipped with internal combustion engines in the next few months. BMW and Toyota are gaining ground. The star vehicles at the next shows will all be rechargeable. But despite this impressive convergence, the electric car will not gather speed along the road to progress. That’s because it will have to address a number of major issues first. The first is the battery – today, electric cars are powered by energy stored in batteries. Metals play a key role in their manufacture. The price of lithium has tripled in three years, while that of cobalt has almost doubled in one year. Lithium, available in abundance, poses technical problems – for example, the resources are located in desert areas and their extraction consumes a lot of water. Two-thirds of the cobalt production comes from the very unstable Democratic Republic of Congo. 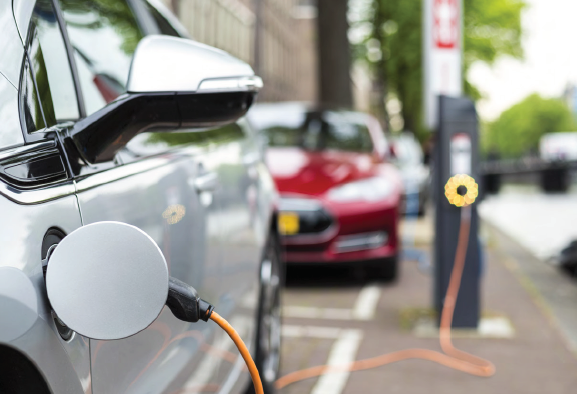 While the sector is equipped to meet current demand (1.2 million electric cars or plug-in hybrids were sold last year), it will require major investment to multiply the offer by ten, sixty or even eighty if we want to electrify the entire production. Cobalt and lithium have two other annoying features. First, their resources are finite. The relatively accessible portion of it is enough to equip the world’s car fleet once or twice over, but no more. Second, their production consumes a lot of energy, as does their recycling. According to consultant Jean-Marc Jancovici, an electric car that will do 200,000 kilometres will have emitted 50 grams of CO2 per kilometre even before it is put on the road! To reduce CO2 emissions, the energy used to produce the battery must also be decarbonated. That’s not easy: the first large battery plant in Europe is planned for Poland, where coal is the primary source of power generation. Which leads to the second issue – the production of electricity. Charging these batteries requires huge amounts of electricity. To give you an order of magnitude: to recharge 1% of the French fleet at night while their owners sleep will require almost the entire production of a nuclear unit. As this is the time of day when no solar power is generated and the wind has often abated, it will be necessary to build new power plants powered by nuclear… or even coal. With the Chinese energy mix, a Tesla emits more CO2 than a good old petrol car by using the well-to-wheel calculation (i.e. the gas emitted before the energy reaches the car). The third issue is the transmission of this electricity. Charging stations are just the tip of the iceberg. A depot of 200 buses charging at night requires the same power as 50 five-storey buildings. If we do not want to install overhead lines to carry this electricity, we will have to dig trenches, or even install expensive superconducting power cables, as tested in New York. However, there are solutions for all of these problems. Progress is possible in the extraction of lithium and cobalt, as we have seen in the case of shale oil. Researchers are working on other electrodes. Solar energy can be used to raise water levels in dams during the day and bring them down at night using turbines. Cars can be charged at the office, and buses by induction during a brief stop. Problems could even become solutions. With digital technology, it is becoming possible to manage power grids much more precisely (smart grids). The electricity in the batteries could be used by EDF to smooth out peak consumption. But all of these solutions require a lot of time, money and investment. “The car will be self-driving before it becomes electric,” predicted the CEO of a leading automotive supplier. While we wait for the advent of the other electric car – the hydrogen powered car – the all-battery car will probably remain a niche vehicle, very far from the universal solution that it embodies today. Volvo will stop producing models equipped with internal combustion engines in the next few months. The star vehicles at the next shows will all be rechargeable. Major investment is needed to multiply the offer by ten, sixty or even eighty if we want to electrify the entire production. To recharge 1% of the French fleet at night will require almost the entire production of a nuclear unit. A depot of 200 buses charging at night requires the same power as 50 five-storey buildings.